A Wood Destroying Organism (WDO) inspection, commonly known as a Pest & Dry Rot (P&D) inspection, is an inspection focused on identifying the verified presence of, signs of, and conductive elements of wood destroying organisms. 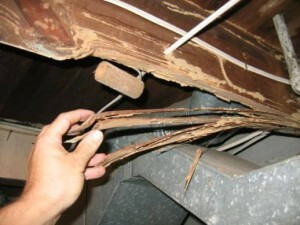 A full-home inspection includes a WDO inspection. A wood destroying organism is an organism that has that ability to compromise the wooden structure of a home. Termites, carpenter ants, and wood decay fungi are examples of WDOs. Why would my home be infested? The primary conductive elements that attract these organisms are moisture, stagnate air, and undisturbed dark places. A good example of this is a crawl space without a vapor barrier on the ground or adequate venting. The lack of a vapor barrier allows moisture to enter the crawl space from the ground, and the lack of adequate venting creates pockets of stagnate air where the moisture will collect and remain. Molds and fungi can easily grow in a home with these conditions. As the moisture builds up on the structural wooden members in the crawl space, wood decay fungi are likely to infest the crawlspace and slowly compromise the strength of the members. This is commonly called dry rot. Subterranean or damp wood termites may also be drawn to live in these environments. Dry wood termites can infest a home if the dry wood is simply close enough to a water source for the termites to bring the water to the nest. Obviously, there is always potential for infestation to occur. The best action to take is to take measures to demote infestation. My house is infested. What can I do? Unfortunately simply removing the moisture problem may not be the solution, though depending on the infestation it could be. Some fungi will die when the moisture is removed, some will continue to grow once they are established. Most infestations from termites or carpenter ants will require extermination. The first step would be to identify the infestation. Either by bringing a sample to an expert, or hiring an expert to come to the property to collect a sample to make an accurate identification. Once identified, the appropriate measures can be taken. Those measures can range from simply removing the conductive elements (Moisture) to hiring licensed pesticide applicators to exterminate the infestation. For preventative WDO measures, see How Can I Prevent Infestation?